Electro-acoustic guitar with dreadnought body shape with cutaway from Classic Design series that delivers sweetly mellow tone and features all-mahogany construction, including the solid top with scalloped “X” bracing. Body features a gloss urethane finish and mother-of-pearl rosette. “C”-shaped neck is made of mahogany and also has a gloss urethane finish. Rosewood fingerboard features 20 frets, pearloid dot inlays, 11.81”/300 radius and a Graph Tech NuBone string nut. Scale length is 643 mm, nut width is 41.3 mm. Guitar is equipped with the Fishman Presys Pickup system with Active On-board Preamp, a rosewood bridge with compensated Graph Techn NuBone saddle and Fender Dura-Tone 880L strings (.012-.052 gauges). It also features chrome die-cast machine heads, a 1-ply black tortoiseshell pickguard, a dual action truss rod, mother-of-pearl headstock logo, black body and neck binding, black/white purfling, and a chrome factory mounted forward strap button with internal block reinforcement. Natural colour design. 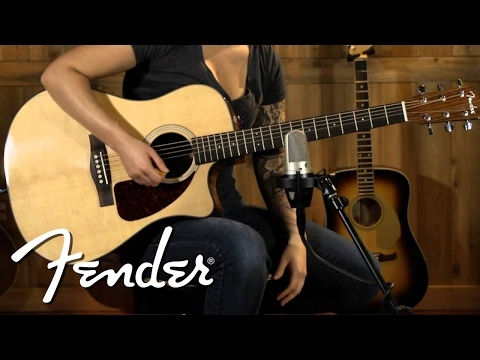 Do you own Fender CD140 SCE Natural Mahagony or have you had a chance to try it?